Papers: In the Christopher Columbus Augur, ca. 1847-1887, 0.63 linear foot. Correspondents include Nathaniel P. Banks. An inventory for the papers is available in the repository. Papers: ca. 1852-1885, 261 items. The correspondence touches on political issues both nationally and statewide, including the concerns of constituents, of newspaper editors (especially regarding the Republican Party press), of job-seekers, and writers on the Civil War period. There are also a few items relating to Nathaniel Banks's service as a Union general in the Civil War. A contents list for the papers is available in the repository. Papers: In the Abraham Lincoln Papers, 1841-1865, 18 items. Correspondents include Nathaniel Prentiss Banks. Papers: ca. 1861, 2 items. The papers include two letters from Nathaniel Prentice Banks. The first item, an undated letter, recommends Mr. Grooms as a competent steward. The second item, dated July 14, 1861, serves as a military pass for Captain Ives of revenue cutter Hope. Papers: In the James Grant Wilson Papers, 1886, 2 pages. A letter from James Grant Wilson to Nathaniel P. Banks dated May 8, 1886. James Wilson requests the completion of Nathaniel Banks's article about himself, and asks if he would be willing to write articles about some of his contemporaries. Papers: In the Park Benjamin Papers, 1645-1925, 6.5 linear feet.. Subjects covered in the papers include Nathaniel Prentiss Banks. A contents list for the papers is available in the repository. Papers: In the John Charles Fremont Papers, 1873, 2 pages. A letter from John Charles Fremont to General Banks dated June 17, 1873. John Fremont refers to the railroad being started at San Diego. Papers: 1850-1880, 109 items. The papers include correspondence, military and political papers, and other material relating to Nathaniel Banks's military service during the Civil War in Maryland, the American Party, and politics in Massachusetts and Maryland..
Papers: In the Joseph S. Beall Papers, 1861-1863, 3 items. Subjects covered in the papers include Nathaniel Prentiss Banks. Papers: In the Edmund Cottle Papers, 1862-1863, 18 items. Subjects covered in the papers include Nathaniel Prentiss Banks. Papers: In the Samuel Styre Papers, 1862-1865, 22 items. Subjects covered in the papers include Nathaniel Prentiss Banks. Papers: In the David Glasgow Farragut Papers, ca. 1826-1913, 285 items. Correspondents include Nathaniel P. Banks. An unpublished finding aid for the papers is available in the repository. Papers: In the Isaac Sherman Papers, ca. 1832-1913, approximately 5,000 items. Correspondents include Nathaniel P. Banks. A preliminary finding aid is available in the repository. Papers: ca. 1829-1911, 113 containers (50,000 items). The papers include chiefly family and general correspondence (1860-1880) with diaries and notebooks, letter books, military papers, speeches, writings, scrapbooks, clippings, printed matter, and miscellany. 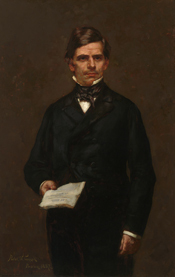 Material relating to the House of Representatives includes papers on the Kansas territorial question, the assault on Charles Sumner, and the establishment of the Republican Party. Civil War topics include Nathaniel Banks's activities as Major General of Volunteers in Maryland, Virginia, the District of Columbia, and the Department of the Gulf, Stonewall Jackson's Valley campaign, the battle of Cedar Mountain, the Red River campaign, and operations at Port Hudson. Other topics include Reconstruction, the Alaska purchase, U.S. relations with Spain and Cuba, the Fenian uprising, early plans for an isthmian canal, and politics in Massachusetts and Louisiana. Family correspondence consists primarily of letters between Nathaniel Banks and his wife, Mary Theodosia (Palmer) Banks. A finding aid for the papers is available in the repository..
Papers: In the James Gordon Bennett Papers, ca. 1845-1934, 225 items. Correspondents include Nathaniel Prentiss Banks. The collection is also available on microfilm. A finding aid for the papers is available in the repository. Papers: In the Zachariah Chandler Papers, ca. 1854-1899, 1.8 linear feet. Correspondents include Nathaniel Prentiss Banks. The collection is also available on microfilm. A finding aid for the papers is available in the repository. Papers: In the Records of the French and American Claims Commission, 1861-1884, 8.4 linear feet. Correspondents include Nathaniel Prentiss Banks. A finding aid for the papers is available in the repository. Papers: In the Whiting Griswold Papers, 1843-1874, 210 items. Correspondents include Nathaniel P. Banks. A finding aid for the papers is available in the repository. Papers: In the Abraham Lincoln Papers, 1774-1948, 48 linear feet. Correspondents include Nathaniel Prentiss Banks. The papers are also available on microfilm. A finding aid for the papers is available in the repository. Papers: In the Reinhold Solger Papers, 1840-1944, 250 items. Correspondents include Nathaniel P. Banks. A finding aid for the papers is available in the repository. Papers: In the William Sydney Thayer Papers, 1835-1901, 600 items. The papers include pamphlets relating to Nathaniel P. Banks. A finding aid for the papers is available in the repository. Papers: In the Gilbert Thompson Journal, 1857-1901, 1 volume. The journal includes correspondence of Nathaniel Prentiss Banks. A finding aid for the journal is available in the repository. Papers: In the Henry Wilson Papers, 1851-1875, 200 items. Correspondents include Nathaniel P. Banks. Papers: 1863-1864, 1 volume. The letter book contains official letters written by Major General Banks from his headquarters, Department of the Gulf, New Orleans, during the fall of 1863 and early winter 1864. The book contains letters documenting civilian life in New Orleans, freed slaves, and the cotton trade. Papers: 1866, 1 item. A letter from Nathaniel Prentiss Banks to an unidentified recipient speculating on the possible outcome of an attack on Port Hudson by forces led by Nathaniel Banks. Papers: In the William S. Beebe Papers, 1864, 2 items. The papers include a copy of a letter of General N. P. Banks dated June 14, 1864, recommending William Beebe to Andrew G. Curtin, Governor of Pennsylvania. Papers: 1857-1890, 1 folder. The papers include bills, telegrams, and letters to Nathaniel P. Banks. Papers: In the George H. Gordon Papers, ca. 1842-1885, 10 boxes, 1 volume, and 1 oversize container. Correspondents include Nathaniel P. Banks. An unpublished guide to the papers is available in the repository. Papers: ca. 1839-1877, approximately 11 items. The papers include correspondence with a variety of individuals on a variety of topics. Individuals represented include John Pierpont, H. W. Halleck, Admiral D. D. Porter, Major Kingsbury, B. R. Hoar, Abraham Lincoln, and the publisher of the New York Tribune. Topics covered include a rule in parliamentary procedure, lecture engagements, instructions for the protection of Washington in case of an enemy raid, patrols of the Atchafalaya River and Berwicks Bay to prevent invasion of New Orleans by Texan troops, employment recommendations, and advertisements. Papers: In the William Henry Redman Papers, ca. 1859-1897, approximately 380 items. The correspondence includes descriptions of Nathaniel Prentiss Banks's Red River Expedition in 1864 in western Louisiana. An annotated list of the papers is available in the repository. Papers: 1879, 2 pages. A letter from Stephen B. Luce, Captain, United States Navy, to Nathaniel Prentiss Banks. The letter relates to a bill in Congress which would mean increasing the Navy's complement of seamen by 750. Papers: In the Aaron Hobart Papers, 1767-1929, 3 linear feet. Correspondents include Nathaniel Prentiss Banks. A finding aid for the papers is available in the repository. Papers: In the Francis Jay Herron, ca. 1861-1877, 1.2 linear feet. Correspondents include Nathaniel P. Banks. Papers: In the Franz Sigel Papers, ca. 1806-1901, 3.2 linear feet. Correspondents include Nathaniel Prentiss Banks. Papers: In the Charlotte Hanes Harding Autographs Collection Persons represented include Nathaniel Prentiss Banks. A finding aid for the papers is available in the repository and online. Papers: In the Ulysses S. Grant Papers, 1863, 1 item. A letter from Ulysses S. Grant to Nathaniel Prentiss Banks written on July 11, 1863. Ulysses Grant congratulates Nathaniel Banks on his capture of Port Hudson, Louisiana, the last Confederate post on the Mississippi River, and reports on various troop movements. Papers: In the James W. Taylor Papers, ca. 1834-1957, 42 items and 10 microfilm reels. Correspondents include Nathaniel Prentiss Banks. The papers consist, in part, of microfilm of originals at the Minnesota Historical Society. Papers: In the Samuel Hooper Papers, 1856-1874, 21 items. Subjects covered in the papers includes Nathaniel Prentiss Banks. An unpublished guide for the papers is available in the repository. Papers: In the Lucia Chauncey Porter Papers, 1853-1917, 429 items. Other authors include Nathaniel Prentiss Banks. Papers: In the Butler-Gunsaulus Collection, n.d., 1 item. An undated note from Nathaniel Prentiss Banks to I. P. Leavitt. Papers: In the William E. Barton Collection of Lincolniana, 1863, 1 item. A letter from Nathaniel Prentiss Banks to Henry Wager Halleck written on August 1, 1863. Nathaniel Banks recommends an immediate attack on Mobile, Alabama. Papers: In the General Nathaniel P. Banks Collection, ca. 1800s-1900s, 2 boxes. The papers include correspondence from and relating to Nathaniel Banks, Banks family photographs, genealogy, clippings, brochures and other items celebrating the centennial of Nathaniel Banks's birth, a brochure relating to the dedication of his statue, typed manuscripts and books on his speeches, biographies and histories about Nathaniel Banks and career, and monographs from his personal library, chiefly relating to his political and military career. The papers also include political materials chiefly relating to the Nathaniel Banks's activities as governor of Massachusetts with a little about his career as a U. S. representative. Papers: 1862, 0.1 cubic foot. A field dispatch from Nathaniel Prentiss Banks to Colonel Ruggles of Culpepper, Virginia, regarding the movement of troops for the Battle of Cedar Mountain. Papers: In the James Elisha Babb Memorial Collection, 1860-1942, 1.5 linear feet. Subjects covered in the papers include Nathaniel Prentice Banks. An unpublished finding aid for the papers is available in the repository. Papers: In the Samuel Bowles Papers, 1853-1890, 1 linear foot. Subjects covered in the papers include Nathaniel Prentiss Banks. An unpublished finding aid is available in the repository. Papers: In the Ernest Brenner Papers, ca. 1869, 4 pages. A letter from Ernest Brenner to N. P. Banks relating to an appointment as a post trader and includes two pages of testimonials. ------. An address delivered by Maj. General N. P. Banks, at the Customhouse, New Orleans, on the Fourth of July, 1865. [New Orleans: N.p., 1865]. ------. Address of His Excellency Nathaniel P. Banks, to the two branches of the Legislature of Massachusetts, January 6, 1860. Boston: W. White, printer to the State, 1860. ------. Address of ... Nathaniel P. Banks, to the two branches of the Legislature of Massachusetts, January 7, 1858. Boston: William White, 1858. ------. American republican politics: remarks of Mr. Banks of Mass. [Washington]: Congressional Globe Office, . ------. Emancipated labor in Louisiana. [New York? : N.p., 1864]. ------. The great questions of national and state politics. Speech of Hon. Nathaniel P. Banks, of Waltham. Delivered at Worcester, before the Young Men's Ratification Convention, September 8th. Boston: Office of the Daily Bee, 1857. ------. Political condition of South Carolina. Report of N.P. Banks, a member of the minority of the committee of investigation, Feb. 28, 1877. Washington: N.p., 1877. ------. The reconstruction of states: letter of Major-General Banks to Senator Lane. New York: Harper & Brothers, 1865. ------. Remarks of Hon. N.P. Banks of Massachusetts on the death of Senator Foot, April 12, 1866. [Washington: Congressional Globe Office, 1866. ------. Revision of the tariff. Washington: [Government Printing Office], 1878. ------. Speech of Hon. N.P. Banks ... upon the representation of the United States at the Exhibition of the world's industry, Paris, 1867. Washington: Mansfield & Martin, 1866. ------. Speech of Mr. Banks, of Massachusetts, on the Nebraska and Kansas bill ; Delivered in the House of Representatives, May 23, 1854. [Washington]: Towers, printers, . ------. Speech of N. P. Banks, jr., of Mass., on the employment of army officers in national armories. [Washington: Towers, printers, 1854]. ------. Speeches of the Hon. Nath. P. Banks ... R. C. McCormick ... Selucius Garfielde ... Chas. W. Kendall ... on the Sutro tunnel ... in the House of representatives ... Feb. 13 and 21, 1873. Washington: M'Gill & Witherow, printers, 1873. ------. Sutro tunnel. Speech of Hon. Nathaniel P. Banks, of Massachusetts, in the House of representatives, February 13, 1873. Washington: Printed at the Congressional globe office, 1873]. ------. Valedictory address of his excellency Governor Banks: to the two branches of the legislature of Massachusetts, January 3, 1861. Boston: William White, printer to the state, 1861. Bird, Francis William. Review of Gov. Banks' veto of the revised code, on account of its authorizing the enrolment of colored citizens in the militia. Boston: J. P. Jewett & company, 1860. Flinn, Frank M. Campaigning with Banks in Louisiana, '63 and'64, and with Sheridan in the Shenandoah Valley in '64 and '65. Lynn, Mass. : Thomas P. Nichols, 1887. Harrington, Fred Harvey. Fighting Politician: Major General N.P. Banks. Philadelphia: University of Pennsylvania Press, 1948. Reprint, Westport, Conn.: Greenwood Press, 1970. ------. "The Life of N.P. Banks to 1861." Ph.D. dissertation, New York University, 1937. ------. Nathaniel Prentiss Banks; a study in anti-slavery politics. [Baltimore]: N.p., 1936. Kassel, Charles. The labor system of General Banks--a lost episode of civil war history. N.p., . Landers, Col. H.L. "Wet Sand and Cotton: Bank's Red River Campaign." Louisiana Historical Quarterly 19 (January 1936): 150-95. Malin, James C. "Speaker Banks Courts the Free Soilers: The Frémont-Robinson Letter of 1856." New England Quarterly 12 (March 1939): 103-12. McDowell, John E. "Nathaniel P. Banks: Fighting Politico." Civil War Times Illustrated 9 (January 1973): 4. Ruggles, Samuel B. American commerce & American union: their mutual dependence briefly examined, by Samuel B. Ruggles, of New York, in a review of the address delivered at the Merchant's Exchange, by the Hon. Mr. Banks, Speaker of the House of Representatives of the United States. New York: Commercial Advertiser job printing office, . Smith, George Winston. "The Banks Expedition of 1862." Louisiana Historical Quarterly 26 (April 1943): 341-60. Williams, Richard Hobson. "General Banks's Red River Campaign." Louisiana Historical Quarterly 32 (January 1939): 103-44. Williams, T. Harry. "General Banks and the Radical Republicans in the Civil War." New England Quarterly 12 (June 1939): 268-80.